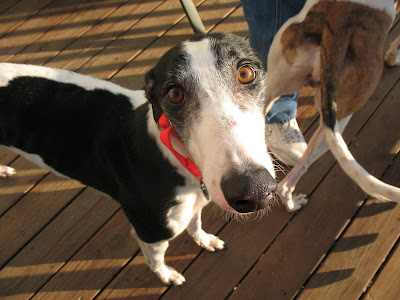 We had three greyhounds come up from Florida this morning...they were all such sweeties! Brian S. and I picked them up from the hauler around 7:45 (much better than the 5am they were talking about last night!) and brought them to their "half-way house" (ha!) for their baths. This was the view in my rear-view mirror. Left to right you have: Alfalfa, Sid, and the little fawn girl is Savvy (which you have to say with a pirate accent, savvy?). Sid sat like that for a good 10 minutes just looking out the window...he is also a smiler. Kenney told me I couldn't keep him because we don't have a fence. That stupid fence is holding me back!! Sid and I bonded. I told Trina that Sid is Blue in Dana's skin. *sigh* such a sweet boy! Doesn't this face just scream TAKE ME HOME?!?! Sid and Savvy getting their run on. 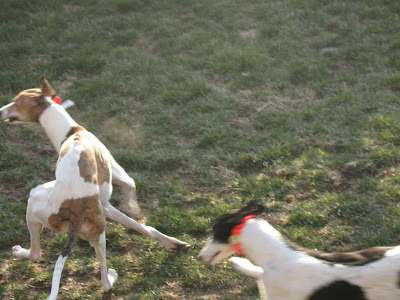 This is the best photo I was able to get that illustrated the crazy goofiness that was Alfalfa...he was the most adorable white and brindle boy! He was big and goofy and just the happiest boy ever...he went to his forever home today. They are so lucky to have such a sweetheart! Sid knows how to work a camera - soooo cute! Great shot of Sid (wide angle lens?) Very cool looking. 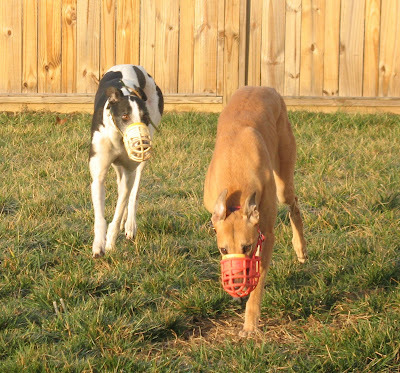 I'm new to your blog although lately I've been reading A LOT of GREYT blogs and forums. I've been trying to spread some info about these cool "greyhound coffees" I bought from this company, Green Tree. They sell a line of coffees with packaging comprised 100% of greyhound pics! 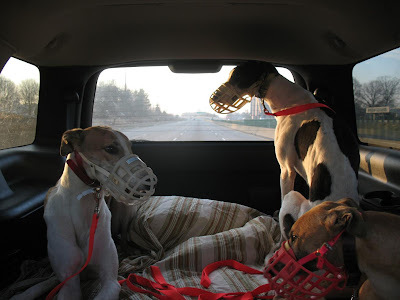 They also donate a portion of their proceeds to their favorite greyhound rescue cause. I signed up for their e-newsletter. This month they're having a sale on the greyhound coffee. then scoll dog till you see the greyhounds! The coffee sale is 25% off all of the greyhound coffees. You just have to enter the code 25DGBRW at checkout. Thought you might be interested. I think the packaging is the coolest thing. I can't get over it! By the way, the coffee is GREYT too!